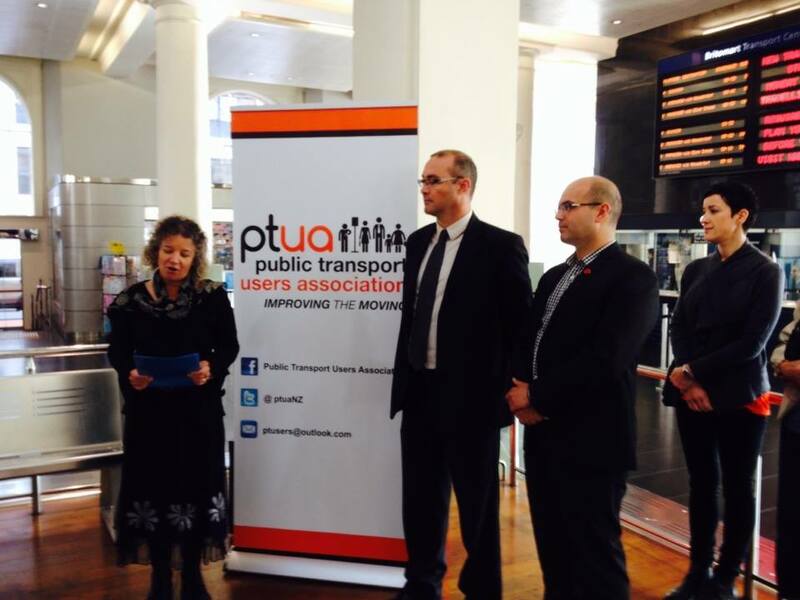 I am pleased to be a part of the founding of New Zealand’s newest transport advocacy group, the Public Transport Users Association (PTUA). I was elected Deputy Chair at the Initial General Meeting on 20 November. PT network advocacy in New Zealand and particularly in Auckland is well-trodden ground with great work being done by Campaign for Better Transport, Generation Zero and Auckland Transport Blog. They all have their part to play and they’ve done it very well, as exemplified by the design of the Congestion Free Network. But there is a large gap in this area; representation of the users of public transport. While there is a great deal of very good commentary on better system design, the voice of users themselves is decidedly muted. Motorists have the AA, cyclists have Cycle Action Auckland, but who is directly representing public transport users themselves? This is the space that PTUA seeks to fill. We are not in opposition to the other pro-public transport groups. We believe that we all need to work together, focusing on our respective strengths, to achieve the best outcomes. Auckland Transport Blog is centred on Auckland and system design; Generation Zero are an under-30s group with a much broader ambit than PT; CBT looks after and works on larger transport infrastructural issues including RoNS. We support all of them. In Auckland, we have a monolithic and largely unaccountable, monopoly provider of public transport services in Auckland Transport (AT). Although there is sporadic criticism of the PT user experience from existing advocacy groups, their focus is very much on system design and its (admittedly fascinating) interface with urban design and planning. Essentially, PT users need representatives, not just planners and traffic engineers. PTUA will work nationally to ensure that PT providers are accountable and responsive to the needs and wants of their customers. We look after passengers on buses, trains and ferries and issues directly affecting them. The PTUA has founding members with a long history and great expertise in public transport such as Dr Graham Bush and Cr Mike Lee. You can follow us on facebook and twitter to keep up to date. This entry was posted in PTUA and tagged Auckland, Auckland Transport, PT, PTUA, public transport, Public Transport Users Association. Bookmark the permalink. Vernon can you confirm whether PTUA attempted to engage with the existing NGO groups you mention? So as to ascertain whether the outcomes it seeks could be achieved via existing NGOs? Or did PTUA presume knowledge about the priorities/plans of these groups? For example, do you know that CBT was not open to running a campaign on WestRail? Or that TB was not planning to act as representatives of PT users? Or grow to become a national organisation? Arguably it is already, as is GenZero. A number of the founding members of PTUA were very involved in CBT. They certainly saw room to cater for PT users in a way that is not currently happening. If they’d seen it as viable to run a campaign on WestRail through CBT I’m sure they would have done that. Having said that, they have not been critical of CBT, they simply see it as an organisation with different priorities. TB and GenZero do indeed have national reach but for the reasons I outline in my post their focus and emphases are different from that of PTUA. Again, I have the greatest admiration for both groups but no civil society organisation should have to seek the permission of others before they form. If any of the other pro-PT groups decide to take an oppositional approach, it is their decision not ours. We have spoken to leaders of CBT, GenZero and TB and made it very clear that we see no conflict in our aims and objectives and are interested in a collegial relationship. The Internet-Mana analogy is quite a reach, especially given that we are not competing for a finite number of progressive votes in a closed system like Parliament. In any event, you mis-interpret the result of the election. I-M didn’t actually take votes off other progressive parties. All they did was scare indifferent centre voters who would never have supported them into the arms of National because of the quite extraordinary behaviour of their narcissistic millionaire benefactor and some of their hired guns. If you see a voice directly representing PT users as ‘additional’ and ‘unnecessary’, I have to disagree. But if that is the case then the only risk is to us. The other groups are well-established and very good at what they do. There is nothing to fear here. All the groups can work together without taking away from any of the others. It will be interesting to note where this goes. PTUA by the looks of it are focusing in on the end user campaign while other groups have sorted themselves around the planning/engineering systems as a main diet (it does not stop them going into end user consumer systems however). So the question will end up being the partnering up when say a public transport project is on the blocks that would enhance end user experiences. The Manukau South Link would be a small example.